Game Drive, Game viewing, Camping, Scenery, Bird Watching, Historic Site Exploration, Photography, Gorilla trekking, Forest Walks, Culture, Boat Trip. Day 2 � Bwindi National Park or Mgahinga. Bwindi, also known as the Impenetrable Forest is one of Uganda�s most recently created National Parks. The park covers 331 sq km and encompasses one of the last remaining habitats of the mountain gorilla. It is here where half � an estimated 320 individuals of the surviving mountain gorillas in the world live. The park contains about 20 forest elephants, at least 10 species of primate (including chimpanzees, Colobus monkeys and baboons), duikers, bushbuck and the rare forest hog. It is here where more than 300 species of bird can be found, an obvious thrill for the keen bird-watcher. It is one of the richest areas in Africa for flora and fauna. At the time of research, there were three groups of Mountain gorilla in Bwindi� - the Mubare group had nine individuals, while the Habinyaja group had split into two groups � group A with 21 gorillas and group B with 9 gorillas. There are a total of 16 permits available per day to visit these families so we will spend an extra day incase bookings are not available. The terrain in Bwindi is mountainous and heavily forested and on a lucky day it may take one hour to reach them, but four hours or more on an unlucky day. Nonetheless, you need to be in good shape. Day 6�and 7 - Queen Elizabeth. Day 8�and 9 - Kibale Forest. Driving further north to the foothills of the Ruwenzori, we will make camp in the lush, tropical Kibale Forest Reserve. From this camp, we will spend time in the forest looking for chimpanzees (an estimated 600) and other primates. Set at an altitude of 1200m, this 560 sq km national park includes the highest density of primates. It is also home to several Colobus monkeys such as the rare red and the Angolan; larger mammals such as the bushbucks, sitatungas, duikers, civets, buffaloes and Ugands�a highest concentration of forest elephants. From Kibale Forest, departure will be early, to be able to drive the long distance to the 3,840 km sq Murchison Falls National Park. O­n the way, we will drive past some painted rocks that are in tribute to the Christian Martyrs. This park is the best all-rounder in Uganda, with animals in plentiful supply and the raging Murchinson Falls easily accessible. The most common large mammals include elephants, buffaloes, vervet monkey, olive baboon, Jackson�s hartebeest, bushbuck, Uganda kob, Defassa waterbuck, Rothschild�s giraffe, hippopotamus, warthog and lion. Over 460 bird species have also been recorded here. Day 11�and 12 - Murchison Falls. 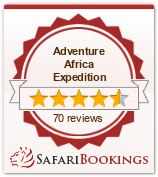 From our camp near the Nile, we explore this park by vehicle and will also take the boat up-river to Murchison Falls. To get there we take a superb boat ride up the Victoria Nile River to their base. En route there are crocodiles and hippos, thousands of birds (including the rare shoebill stork) and usually elephants. The best viewing of the 43m falls is up close. It is spectacular to see the 50m wide Nile squeeze through a 6m wide cleft in the rocks, and virtually shoot out the other side. It is possibly the most powerful natural surge of water found anywhere else in the world. On arrival at the airport, you will be met your safari guide who will warmly welcome you and depart by road to Lake Mburo National Park (the drive will take approximately 3-4 hours). You will have a stopover to look at the Royal Drum makers, stand at the Equator for a photographic opportunity and also listen to some few interesting facts. We will continue to Lake Mburo National Park.� This Park is an extension of the Tanzanian plains with big herds of zebra, impala, eland and other ungulates. Bird viewing opportunities are excellent - for birders, this is one of the best places to find African fin foot, papyrus bush shrike.� After checking in, you will take a late afternoon game drive or a dug out canoe. An early start � a wonderful chance to take a guided nature walk. This walk takes you to the Salt Lick Area. A strategically located wooden platform (Observation point) offers a chance to see at least four different species of animals at any one point while they lick the salty soil. Return to the camp for breakfast, after which we will head through the highlands to Kabale, where we will stop for lunch. Continue on your journey, which offers excellent views including the triangular peaks of the Virunga volcanoes of Rwanda and the Congo. The road then drops down into a valley, to Bwindi Impenetrable National Park, home to the mountain gorillas! Up relatively early for a hearty breakfast to give you the energy needed for gorilla tracking. Before 8:00 am report to the ranger station for registration and a talk by one of the rangers; the guides will then take you through the bush pushing your way through the undergrowth, parting thick creepers, to track the gorillas. (This trek can take from half an hour to 5 hours � a reasonable degree of fitness is required as well as a sturdy pair of walking shoes) Sit in the forest among the gorillas, listening to them grumble to each other, and marvel at the sheer size of the dominant male; the silverback. It is an extraordinary feeling sitting in the dense rainforest knowing you are with a few of the last remaining mountain gorillas. It�s amazing to think there are only about 650 of these beautiful creatures left! If you have the energy this afternoon, take a guided walk on the Munyaga River trail, which is an ideal short walk. This trail leads to three delightful crystal clear waterfalls, and there is a profusion of tree ferns, epithytic ferns, orchids and Bwindi�s colorful array of butterflies. Here you may also see birds and primates from the forest edge. If you have the afternoon free, how about a guided village walk � see how the Ugandans live!